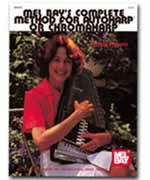 The most complete, authoritative text available on autoharp. Teacher and author Meg Peterson presents a colorful array of songs and styles as well as a myriad of strum patterns in an easy-to-understand manner. This self-teaching course features Meg's highly acclaimed system for teaching melody solo performance on the autoharp. Each of its 48 lessons builds on the one before it, with a reference section included for those who wish to learn about music notation, theory, harmony, transposition, and chord substitution. There are 122 practice songs and many more suggested ones. Also included is information on tuning, changing strings, and altering chord position on the instrument.